Mobile electronic devices (or e-Books) specifically designed for reading books and magazine have become a wildly popular alternative to the traditional paper book. While paper books certainly have their charm, the benefits of eBooks can't be understated. They are easily portable and much lighter than carrying a bunch of books around. You can easily access almost any book you are interested in without a trip to the bookstore thanks to instant downloads. And the books available online with an eReader can even be cheaper than traditional paper books to buy. Also, thanks to the growing widespread popularity of e-Books, there's a wider range of stories available than ever before. Reading your books on a mobile device is a life changer for anyone who loves reading books. But there is one serious drawback with electronic devices that are dedicated to books. The biggest drawback to reading your books on a e-Book reader is that you normally have to buy a completely new machine in order to join the eReader community. If you're like many folks, you are finding that your home is becoming ever more cluttered with more expensive electronic devices. And your pocket and bags are already laden with various devices you need to lug around. Luckily, there's another option! You can try reading your favorite books using the smartphone you already own and drop having to buy and use a dedicated book reader altogether. 1. You will have access to your books anywhere and anytime you want to read. The biggest advantage that eReader apps have over an eReader is that you always have your smartphone with you. No matter where you are, you'll have your phone in your pocket or your bag. No need to try to remember to bring your reading device when you think you may want to read a book. Since you always have your smartphone with you, you can always use your eReader app to easily read your books anywhere and anytime. And since your smartphone already is connected to the web, you don't need to worry about a web connection as you would with a e-Reader device. 2. 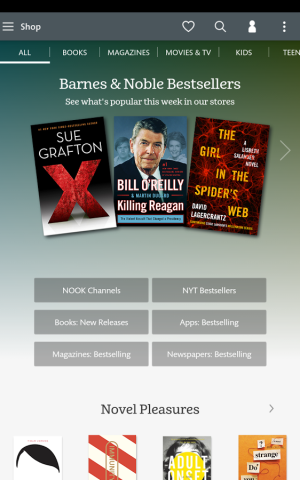 You can buy and start reading your books instantly directly through your phone. As a smartphone user, you're probably used to buying products and services through your device. You order takeout meals, music, and apps themselves through your phone, so why should books be any different? You can order the book, download it, and start reading it within minutes, all within the same app. Now that's convenience. Plus, as eBook Friendly points out that you can now access a large number of free, public domain eBooks through eBook stores on your phone now, too. 3. No additional special devices are needed. If you have your smartphone, you have your books with you. You don't need to remember to bring along your e-reader. You don't need to carry another device that weighs you down. Although e-readers are much more convenient and portable than carrying real paper books around, these devices are still much heavier and bulkier than not having anything additional you need to carry when you want to read a book. So just take your smartphone with an e-Reader app and you are freed of having to carry around your special e-Reader device. 4. e-Reader Apps can be adjusted to your specific needs. If you need to make adjustments to your reading material, such as changing the font size or screen color, you'll find that eReader apps have you covered. The Nook App, for example, is a great app to read books with as it allows for a huge degree of customization. You can tweak with your settings until the app displays books just how you want them, creating the perfect reading experience for you. 5. You can sync your books across multiple devices. Nothing's worse than having to stop reading because your device's battery has died, or you've forgotten to bring your eReader out with you. If you use eReader apps, no worries! Most e-Reader apps allow you to sync your books and progress across multiple devices, meaning you can pick up where you left off, even if you switch to another device. 6. No more need to haul around heavy books. If you're currently a student and own an iPad or similar device, eReader apps make studying a breeze. You can download your essential texts, meaning that you're no longer hauling your huge and heavy books around campus. Also, as Mac World emphasizes, you can highlight passages and make notes directly on the text, something you couldn't do on a physical book without devaluing it considerably, or seriously annoying your librarian. 7. The eReader apps offers much more than just books. You'd think that it'd be enough to offer thousands of titles through an eReader app, but many apps offer other forms of media for added value. If you're into listening to audiobooks on your morning commute, or watching movies and TV shows on the bus, then eReader apps have you covered. They offer an enormous array of entertainment, all in one app. Smartphones have become ubiquitous, and with good reason. These tiny computers can fit easily into our pockets, yet despite their small size, they offer us the whole world at our fingertips. With clear screens and Internet access, they're the perfect devices on which to read eBooks. Download an app from your preferred provider and see just how much entertainment and convenience one app can provide. Once you enjoy the power and convenience of having your books easily accessible on your smartphone, your e-Reader device will sit at home.